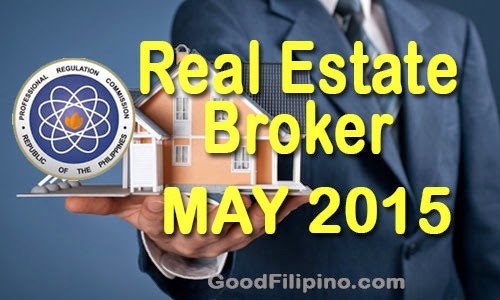 The Professional Regulation Commission releases the licensure examination results for May 2015 Real Estate Broker board exam held on May 24, 2015. PRC and Board of Real Estate Service given the said exam in the cities of Manila, Baguio, Cagayan de Oro, Cebu, Davao, Iloilo, Legaspi & Lucena. Last year, PRC released the 2,048 out of 3,535 passed the Real Estate Broker Licensure Examination in the said testing center above. The Board of Real Estate Service members who gave the licensure examination are Dr. Eduardo G. Ong, Chairman; Ramon C.F. Cuervo III, Florencio C. Diño II and Rafael M. Fajardo, Members. Usually, PRC announced the results after the five (5) working days, after the said examination. You may expect the official results on June 1, 2015. Examinees and all who waiting for the Real Estate Broker board exam results release are encouraged to bookmark and visit this page more often. Comments or suggestions about "May 2015 Real Estate Broker Board Exam Passers - Real Estate Exam Results " is important to us, you may share it by using the comment box below.